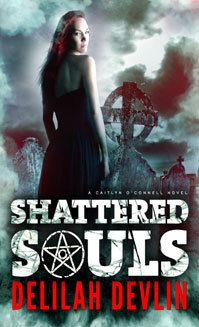 One Day to Shattered Souls — Ssssupernatural! My webmistress did some updates on my site yesterday, and provided me a lovely surprise! The sequel to this book, entitled Lost Souls, is already up for pre-order on Amazon! And it’s set to release sooner than I’d expected—June 4, 2013! Read a description of the story when you click the link. You want to know if I deliver on the spooky elements of the story. Judge for yourselves. Here’s just a tease. Cait didn’t like graveyards. They were too damn noisy. The staticky hum began even before she’d parked the car inside Edgemont Cemetery’s gates. Spirits clamored, eager to connect. But her creaky “Spidey sense” tingled, telling her the ghosts of the departed weren’t the only phantoms there. From the moment she’d stepped out of the car, she’d felt an eerie, heavy presence. Maybe she was uneasy because the sky had darkened with heavy, gray clouds where moments ago there’d been wispy streaks of white sliding across a blue sky. She’d shrugged it off as coincidence, unwilling to give in to the urge to slide her hand into her pocket and clasp the familiar flannel bag she’d stuffed there before she’d left her apartment. Maybe it was the section of the cemetery she approached. Here the graves were older and many studded with ostentatious statues—lambs adorning children’s graves, their features blurred by erosion, and angels grown grubby with soot and dirt—hovering over sad little plots where rain and time had sunk the mounds. Water from the previous night’s storm settled in the hollows. The prickle of goose bumps lifted the fine hairs on her arms and the back of her neck. Electricity crackled in the air. And the whispers, usually so many that their individual messages were lost in the noise, coalesced into a single thrumming chant. Cait grew rigid, a heavy knot of dread settling in her belly. If she’d been alone, she might have heeded the warning. “Hey, I found them,” Jason called from a small, manicured square enclosed inside a wrought iron fence. “Constance, Hope, Charity, all sisters. Here’s mom,” he said, pausing in front of the grave marked with a modest headstone. “Margaret Worthen. Damn, they all died on the same day.” He turned to aim a questioning glance her way. Like she should know why they were here looking at the headstones of a family who’d died a century and a half ago? The list they’d found in the girl’s apartment had led them on this wild goose chase. A tendril of ice-cold air teased along her cheek, and she recognized the chill for what it was. Then something moved at the corner of her eye. Expecting the caretaker who’d led them to the family plot and hovered nearby in case they needed further help, she turned, only to find a tall marble statue beside her—Blessed Mary dressed in robes, a finger lifted to her lips, which might have looked a little less sinister if her face weren’t blackened with grime. Cait grimaced, thinking she’d let her imagination get away from her because the place creeped her out, but she couldn’t drag her gaze away. Some inner instinct held her immobile. The statue shifted. Almost imperceptibly. Her head lowering toward Cait. Chest tight, Cait jumped back. “Jason, stop!” she tried to shout, but her throat constricted. The chill wind stiffened, grasping like invisible fingers at her hair and clothes. “Jason,” she repeated faintly. How would she explain this? Frozen, she reached into her pocket and crushed the red flannel bag in her fingers, grateful as never before for her mother’s intervention. Jason straightened and stepped backward, but his foot fell into a deep puddle at the edge of the mother’s grave. Cursing, he tugged his boot, but the suctioning mud held it. The statue behind him was an angel whose even features slid into a narrow-eyed glare and whose lips pulled away from its teeth in a feral snarl. It reached out. The caretaker stood at the bottom of the hill, his dark face tightening, eyes widening as he stared at the statue Jason had yet to see. 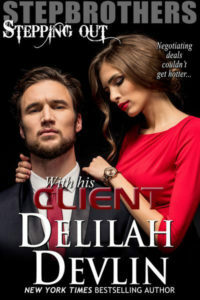 She grabbed his hand and pulled him down the rise, falling in beside the caretaker, who didn’t need convincing. “Holy Mary, mother of God…” he whispered under his breath. “Consecrated ground,” she blurted, racing along, pulling still on Jason’s sleeve. An angel with its serene face tilted toward the sky opened its eyes and peered down at them, the sockets hollow and black. “Follow me,” the caretaker said, his burly body surprisingly nimble as he cut across a row of graves and headed to the east side of the graveyard. The cold tendrils grew stronger, clawing at their backs. The trio’s labored breaths puffed in frozen clouds. “Here,” whispered the caretaker, stopping at a stucco-and-concrete crypt and pulling out a ring of keys. His fingers shook as he flipped through them, found the one he needed, and unlocked the door. The three of them lunged inside and slammed the door behind them. Cait set her back to the door, digging in her heels. The door shuddered against her. “What’s goin’ on, Cait?” Jason asked, his voice tightening, his gaze jumping from her to the worker. 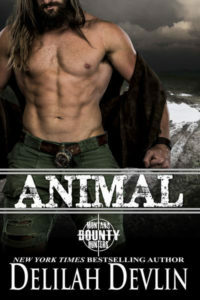 “Did I mention that Henry’s killer isn’t human?” she said, her breaths ragged. “I’m sorry, Jason. I never expected a freaking wraith to follow us here.” The door continued to rattle, and Cait began to worry about the stained glass panels at the far side of the crypt. Although she’d given up on God a long time ago, she made the sign of the cross over her chest. The caretaker lifted a shaky hand like a child requesting permission to speak. “What?” Cait bit out as the door rattled harder. She wouldn’t admit to the two men who were looking to her for all the answers that she hadn’t strategized beyond finding shelter. Cait slid down the door, letting the wind ravage outside unchecked. She reached into her pocket and pulled out the ratty, red flannel bag. For a long moment, she stared. Then, drawing her courage around her like a cloak, she crushed it in her fist. It was just fabric, filled with desiccated flowers soaked in dragon tree oil. Not a precious gift her mother had given her. She had to try something.